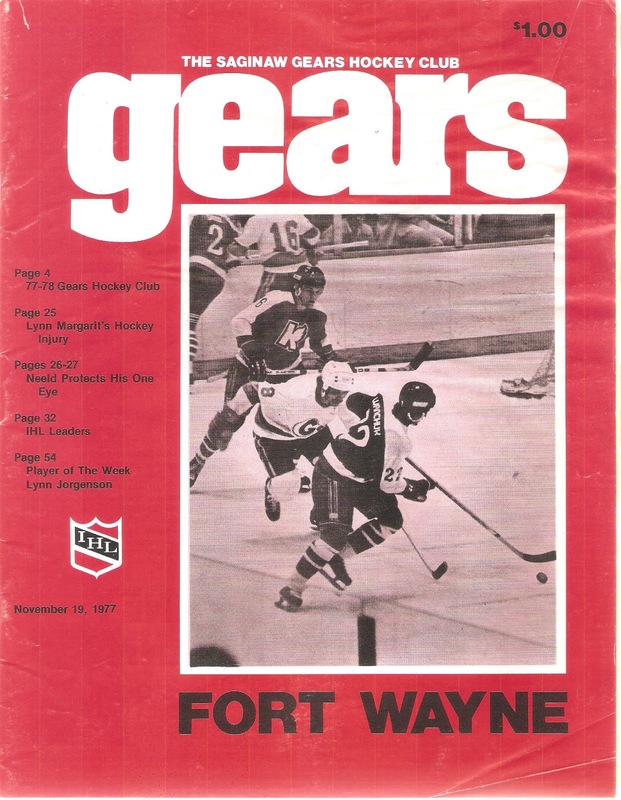 The Saginaw Gears were the defending Turner Cup Champions heading into the 1977-78 IHL season. Wren Blair continued to run the six-year old franchise as President/GM, while Don Perry was back behind the bench. 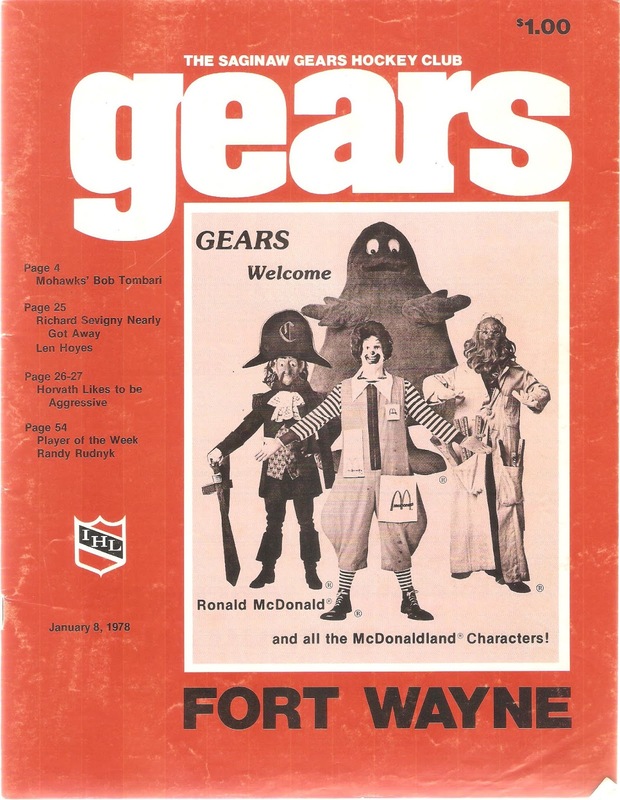 The Gears were still a secondary affiliate of both the Toronto Maple Leafs and Los Angeles Kings. Championship teams often experience numerous call-ups after the season, and the Gears were no different. Coach Perry had to replace players such as leading scorer Paul Evans, future NHL defenseman Greg Hotham and goaltender Mario Lessard. 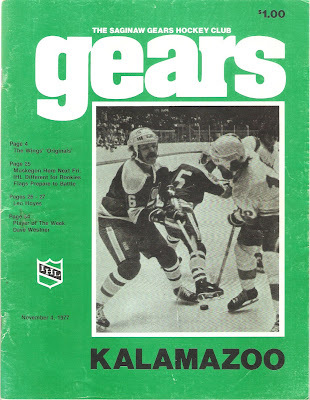 Saginaw also lost forward Wayne Zuk and defenseman Gordie Malinoski to retirement. However, their replacements were more than up to the challenge in 1978. The Gears finished the season with a spectacular 40-28-12 record. Their 92 points clinched the team's third-straight North Division title, 8 points head of the Kalamazoo Wings, and just 5 behind Huber Trophy-winning Fort Wayne. Perry enjoyed coaching the second-best offensive team in the IHL that year, as the Gears lit the lamp 360 times. They were led by the always-dependable Marcel Comeau. The gentlemanly Comeau scored 42 goals to go with 103 points, while only spending 16 minutes in the penalty box. Another Gears original, Dennis Desrosiers, topped the team with 51 goals, along with a not-so-gentlemanly 288 penalty minutes. Newcomer (and Kings prospect) Warren Holmes nearly reached 50 goals himself, tallying 48, to go along with 81 points. Two other Gears scored at least 30 (Stu Irving and Rick Chinnick), while three others had at least 20. Saginaw's defense was the league's best that year, as the Gears allowed just 278. Losing a goalie the calibre of a Mario Lessard can be difficult, but Saginaw enjoyed a strong 1-2 punch in net. Pierre Chagnon, who faced the Gears as a Toledo Goaldigger in the 1977 Turner Cup Finals, came over to Saginaw and made it into 35 games in his final season of hockey. He was joined in net by second-year goalie Lorne Mollekon, a future Goaldigger himself, who was in goal for 39 games. Chagnon got the nod in net for the playoffs. Saginaw hockey fans and most hockey experts expected the Gears to make their fourth trip to the Finals in six years. However, those plans were quickly derailed by the upstart Port Huron Flags. The Flags, who finished the season at just 33-32-15, were in fourth place in the North Division in 1977-78. However, they had little difficulty with the Gears in Round One, shoving them aside in 5 games and outscoring them 31-19 in the process. 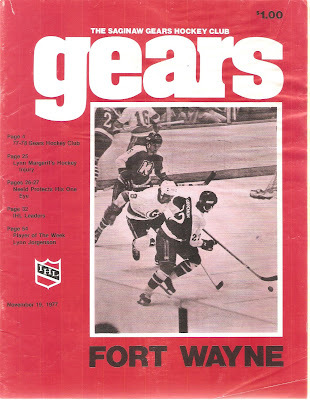 Port Huron would reach the Turner Cup Finals before falling to the Toledo Goaldiggers in a memorable seven-game series. My parents bought several Gears programs from an antique store in Saginaw awhile back. Three of them were from the 1977-78 season, each from different games. All three have the same format, just a different colored cover and picture. Each program is 54 pages long and mostly black-and-white, though there are numerous color advertisements. Each one also has articles about the rest of the league, including one by the Flint Journal's Len Hoyes. Each one also has a profile on a Player of the Week. The red and green programs have inserts with up-to-date statistics, with the Gears Bingo game filled out on each. They also have player posters as well, featuring defenseman John Gravel (green program) and forward Stu Irving (red program). Local advertisements include Big John Steak and Onion (including the one in Caro! ), Sid's Clothes Shop, Saginaw Steering Gear, Frankenmuth Bavarian Inn and Peet Packing Company. Car ads include the 1978 Chevrolet Monte Carlo and the 1978 Oldsmobile Cutlass Supreme Coupe. "I.H.L. 1977-78 Regular Season Statistics", 1978-79 Photo Album. Saginaw Gears Hockey Club.